“It was amazing for all the company to be there to watch and support them"
Paul Said: “I’ve been in the industry for over 30 years and the Masterfitter challenge has been by far the most nerve wracking thing I have ever had to do with the filming, the compere with the microphone asking questions and installing live before an audience. Even though it was nerve wracking I would love to take part in the next Masterfitter challenge”. Paul wanted to thank his employers for nominating him for the challenge and for all the staff at YES glazing for taking time out to come and support him and Tom. He also expressed his congratulations to the winner. Tom added: “I’m really disappointed at not winning but glad I got the opportunity to take part and would take part in future events. I liked the fact that there was no tension between the installers taking part in the competition and everyone got on, it felt like there was togetherness in the industry. The whole exhibition was a very enjoyable experience”. He also thanked YES Glazing for having the confidence in him to enter him into the competition. 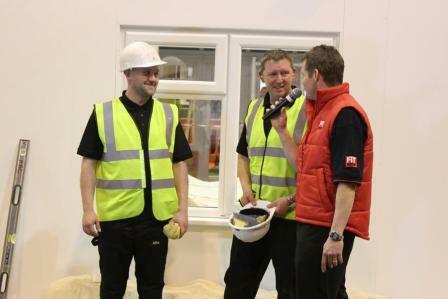 YES Glazing’s Solutions’ James Howard said “we really enjoyed the whole thing and are very proud of Paul and Tom. Even though we didn’t take the title this year, we feel our boys stood out and were a credit to us. It was amazing for all the company to be there to watch and support them. Congratulations to the winner this year. A big thank you to everyone involved in the masterfitter especially Joanne Taylor of IPS for all the support along the way, and a massive well done to our own Paul Casbolt and Tom Miller for an amazing effort. Bring on the 2014 challenge”.